The pair, Essex teenagers Jonathan Antoine, 17, and Charlotte Jaconelli, 16, were beaten by novelty act Ashleigh and Pudsey in the talent show. They have signed up with Simon Cowell's record label, Syco Music, and plan to release their first album on September 3. 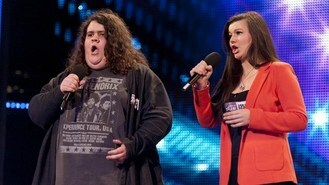 Cowell said: "This show is designed to give people like Jonathan and Charlotte an opportunity. I think their debut album is going to be stunning." Jonathan said: "Appearing on the show has been a huge confidence boost and I'm still pinching myself that we are actually making our album. Thank you to everyone for making this happen for us."